The first 1,000 tickets for Beau’s Oktoberfest, which came with a CD sampler of the bands who will perform at this year’s event, are now sold out. Ticket sales began August 9, and the last of the 1,000 Earlybird tickets were snapped up over the weekend. Tickets still remain for all three days of the festival, but organizers advise would-be attendees not to delay as tickets are selling at double last year’s pace. Only 4,500 tickets are available for sale for each festival day: Friday Sept. 28, Saturday Sept. 29, and Sunday Sept. 30. “We were super excited to see how quickly people started buying tickets this year,” says Beau’s co-founder Steve Beauchesne. “We put the tickets up at 4:30 am and grabbed a few hours sleep, then checked back just to make sure the technical stuff was working smoothly, and 100 were already sold,” he laughs. “We’ve got a great musical line-up, and somehow packed even more activities and fun stuff into the three days, so it makes sense, but it’s still great to see,” adds Beauchesne. 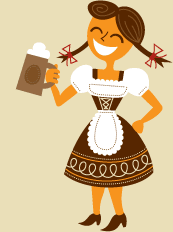 Oktoberfest is the signature fundraising event for Beau’s All Natural Brewery, and takes place at the Fairgrounds in Vankleek Hill, Ont. Beau’s Oktoberfest is a three-day Bavarian-themed celebration of craft beer, local food and independent musicians. This year’s fundraising benefits local charities Operation Come Home, JustFood, and the Vankleek Hill Agricultural Society. To help further boost the Oktoberfest funds raised this year, Beau’s has enlisted local sponsors Desjardins Caisse Populaire Nouvel-Horizon, Harden Group, and Theoret Martel Proudfoot Insurance Brokers Ltd.
Single-day passes for Oktoberfest 2012 are $18 including GST, or one can save $9 on daily admission by purchasing a 3-day pass for $45. Round trip bus transportation from Ottawa can be added to any daily ticket for an additional $15. Tickets are available online at www.beaus.ca. Beau’s is still looking for Oktoberfest “Volunbeers” who will get a free 3-day pass to the festival in exchange for helping out for one half-day shift. Information about Volunbeering can be found at http://www.beaus.ca/volunteer.